Art Asylum is the little company that refuses to quit. Every time it looks like they're about to take their final bows in the industry, they come back swinging. Their Star Trek line seems to finally be heading for the final frontier, Diamond Select picks up the license and starts things anew with Deep Space 9. It seems like the DC Minimates have failed, and all of a sudden Target is stocking them on its shelves. We'll begin this review with the construction set first, so if you're just interested in the Minimates, just skip down a bit. 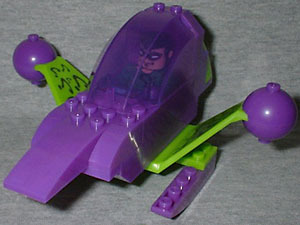 This set is the Riddler Mini Flyer, a one-man aircraft cast in tones of purple and green, just like its owner. The flyer has a pretty ugly design, with up-swept wings terminating in large purple spheres (knockout gas tanks). The landing gear (VTOL flight skid support) looks suited for a water landing, and there's a large, hooked nose (low yield EM blaster) at the front. The translucent purple canopy (rapid escape hatch) is hinged for easy access, and there's a tiny control panel and stick in the cockpit (cockpit). Really, the mini flyer is pretty lame. It looks goofy, and it has no place in the comics. The only reason it exists is so that Art Asylum can call this a construction set. It does raise the question, though, of exactly how few pieces AA has to include in one of these sets to make it count - 20 pieces? 10? What's the lower limit? Assembled from 44 pieces, the finished Mini Flyer is 5" long and 2 3/4" tall. You can tell at a glace that it is supposed to belong to the Riddler, but it just doesn't seem like something he'd use. The C3 modular bricks plug into each other just like Legos and Mega Bloks, and they hold together well - nice tight bonds, but easy enough to take apart when you want to. The instruction booklet isn't very clear about precisely where the blocks need to fit on what's been previously assembled, but it's not too terribly hard to figure out. Though the previous sets included two Minimates, the Mini Flyer sets include only one - bet you can't guess who! The Riddler is one of Batman's craftiest foes, able to actually match wits with the world's greatest detective. Here's a guy that is so smug, so sure of himself, that he can tell police exactly how he's going to do it, and they still can't figure it out. As a super villain, he's Steve Martin. 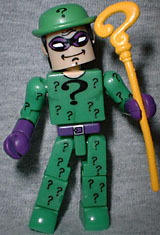 Though Riddler's recently had a completely stupid metrosexual makeover in the comics, this Minimate is the classic version: green jumpsuit with dozens of little question marks all over it. The suit is done nicely, with his physique suggested by darker green shadows. His belt, gloves and mask are purple, and the itsy bitsy question marks are printed well. Riddler's got a bemused look on his face, and features two hair pieces: one with a green bowler, one with just his hair. Included with the set is a question-mark cane but, like the Joker's, it's made from a very soft plastic and prone to warping. It doesn't help that it's bagged in the set instead of tucked in the tray with the figure. For legal reasons, the DC Minimates can only be sold as part of these building sets, so they have block-compatible holes in the bottoms of their feet. Other than that, they share the same body as their Marvel counterparts, and move at 14 points: neck, waist, shoulders, elbows, wrists, hips, knees and ankles. The hair pieces plug into a hole in the top of the figure's head, to help hold them in place. The packaging design for the C3 sets is nice - not only does it make good use of bright primary colors, but it is also designed so that the Minimates are visible through the box. This is a particularly good choice, because otherwise less-scrupulous fans would buy the set, take out the figures and return it. It looked like the C3 sets were going to be short-lived, but the line just refused to die. It's nowhere near as expansive as the Marvel characters, but the blame for that lies squarely on the shoulders of DC. Yes, the tiny plane is dumb, but for less than the cost of a pair of Marvel Minimates, it's worth picking the set up and showing retailers your support. How small can one of these construction sets be? Tell us on our message board, the Loafing Lounge.